Sometimes called alloy 904L, N08904 stainless steel isn’t the most widely used stainless steel in the world, but it still serves plenty of practical purposes. Possessing top-notch weldability and corrosion resistance, it is used in a number of different industries. Interested in learning more about the common uses of N08904 stainless steel? If so, you’re reading the right article. Below, we’re going to discuss everything you need to know. N08904 stainless steel is utilized — in at least some capacity — in a number of different industries. However, there are three particular industries that are the primary users of N08904. They are the oil industry, the chemical processing industry, and the paper manufacturing industry. The oil industry requires an array of stainless steel products in order to transfer, distribute, and process oil. Typically, the industry utilizes N08904 stainless steel to build processing components. Perhaps no industry utilizes N08904 stainless steel more than the chemical processing industry. This industry utilizes the steel to handle a variety of corrosive chemicals, from sulfuric acid, to phosphoric acid, to organic acid, to inorganic acid, and more. This type of stainless steel can handle everything from fertilizers, to medications, to soaps, to drain cleaners, to a variety of other products. The paper manufacturing industry also utilizes N08904 stainless steel. Again, this industry utilizes the steel primarily for processing purposes. It’s usually used to contain the dyes that whiten and color paper. Why is N08904 Used for These Purposes? As you can see, N08904 stainless steel is commonly used for the processing of chemicals. The question is: why is it used for the processing of chemicals? What characteristics make it appropriate for such use? The primary answer to this question is high corrosion resistance. 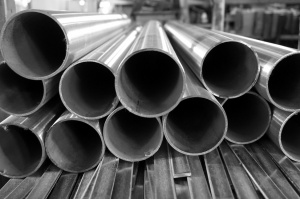 Whereas many types of stainless steel will corrode quickly upon contact with sulfuric acid, phosphoric acid, and other highly-acidic chemicals, N08904 stainless steel does not. However, this is not the only area in which alloy 904L excels. In addition to being anti-corrosive, it’s also highly resistant to heat. This particular type of stainless steel can maintain its structure at up to 700°F. It can do this while, generally, suffering no form of visual oxidation. We should also mention the malleability and weldability of N08904. This steel can be shaped and manipulated to into a variety of different forms. Because of its malleability, it can be easily attached to other pieces of steel through welding. This allows for it to be made into intricate designs. All of these characteristics together make N08904 such a versatile product. There is no other form of steel that can combine these characteristics in the way that 904L does. What Components are Typically Made of N08904? There are a number of components that are made out of N08904 stainless steel. However, the most common types of N08904 components that you’ll see include pipes, fittings, flanges, bars, tubes, and plates. As we discussed above, this steel is used primarily in chemical processing situations. If a device is going to be used to process chemicals, it will most likely consist of N08904 stainless steel components. Do you have a need for N08904 stainless steel (alloy 904L) components? Looking to buy those components now? If so, Great Plains Stainless is the company to call. We offer a wide variety of stainless steel components, from pipes, to fittings, to bars, to plates, and more. Regardless of where you’re located in the world, we are capable of getting these components to you.